The "at least one" aspect of Korver's streak brings to mind baseball hitting streaks (i.e., number of games with at least one hit). Let's refer to a made three-pointer in basketball or a hit in baseball as a "success." To calculate the probability of a streak of games with at least one success, one needs to know the probability of at least one success in a given game, and to determine that, one must know the probability of a success in a single trial (a shot in basketball or an official at-bat in baseball). The above-linked USA Today article, published when Korver's streak was at 87 games, noted that he had shot 46.9% (226-for-482) on treys during the streak. Consulting Korver's game-by-game log on ESPN.com, we see that he has made an additional 40 treys on 82 attempts in his last 11 games (note that he missed four games between Nov. 27 and Dec. 2 due to injury). Thus, the last 11 games have raised Korver's three-point shooting percentage during the streak to 47.2% or .472 (based on 266/564). We will use Korver's .472 shooting percentage on threes to represent his probability of success in a single trial. During Joe DiMaggio's Major League Baseball-record streak of getting at least one hit in 56 consecutive games, set in 1941, his batting average was .409. That would be DiMaggio's probability of success in a single trial. The number of trials or opportunities an athlete gets per game is also a crucial factor. In basketball, of course, a player can shoot as often as the coach wants him or her to, whereas in baseball, teams follow a batting order that limits each player to one at-bat for every nine taken by his team. With that distinction between basketball and baseball noted, dividing Korver's 564 three-point attempts by the 98 games in which they have occurred yields an average of 5.76 attempts per game. DiMaggio averaged 3.98 at-bats per game. * Because Korver has had a higher success rate in his task (making three-point shots) than DiMaggio had at his (getting hits), and because Korver has had more attempts per game than DiMaggio, it is not surprising that the length of Korver's streak has greatly exceeded DiMaggio's. 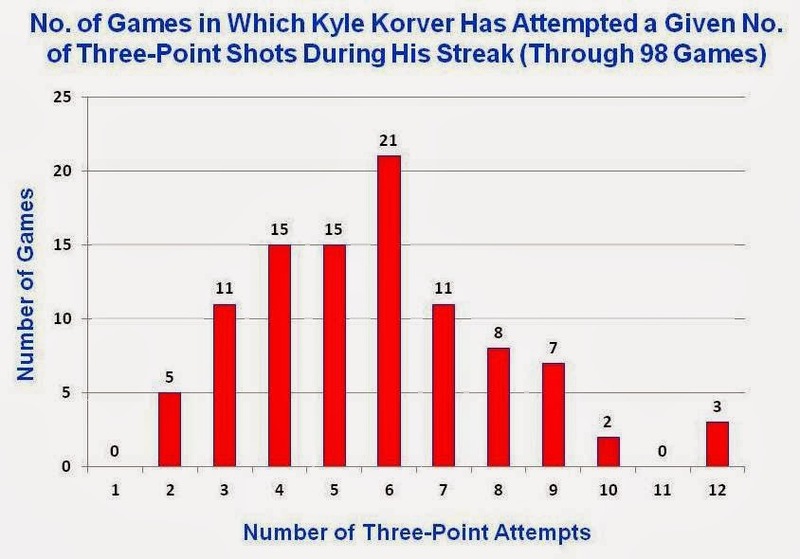 With roughly a 98% chance in each game of making at least one three-pointer (as long as he gets six attempts and has a .472 likelihood of success on each one), it is no wonder that Korver has been able to maintain such a long streak of games with a trey. To complete the calculation of Korver's probability of hitting at least one three-pointer in 98 consecutive games, we would raise .978 to the 98th power. This yields .113, for a roughly 1-in-9 chance that Korver (or other players whose three-point attempts and shooting percentages are similar to Korver's) would hit a trey in 98 consecutive games. 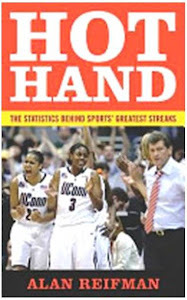 As discussed in my book Hot Hand (pp. 54-55), researchers David Rockoff and Phil Yates offered the useful reminder to streak analysts that, even though a player averages a certain number of opportunities per game, he or she may get more opportunities than average or fewer opportunities than average in any particular game. The above calculation for Korver, assuming a consistent six shots per game, may thus have to be taken with a grain of salt. If, for example, Korver launched only two three-point attempts in a given game, he would not have a 97.8% probability of making at least one three in the game. Instead, we would take his miss rate (.528) and raise it to the second power (corresponding to two shots) to estimate the probability of an all-miss game; the calculation yields .279. With only two shots taken, therefore, Korver would have a 1 - .279, or .721, probability of making at least one trey in the game. That's still pretty high, but not as near-definitive as .978. With more than six shots in a game, Korver's probability of making at least one three-pointer would be even higher than .978. With 10 shots, for example, we would take 1 - (.528 to the 10th power), which yields .998. To explore this issue further, I've plotted the number of three-point attempts taken by Korver in each game of his 98-game streak. The most common scenario (evident in 21 games) is that Korver attempts exactly six treys per game. Games with fewer than six attempts (46 total) are somewhat more common than games with more than six (31). Still, he's had no games with just one attempt and only five with two attempts. 10 times in the first quarter. 4 times in the second quarter. 5 times in the fourth quarter. I think I've provided several statistical angles on Korver's streak. However, the USA Today article has even more, including how many miles he runs on the court per 48 minutes, trying to get himself open for threes! Here is the link again to that article. *The DiMaggio statistics and a fairly straightforward discussion of how to calculate streak probabilities are available in this article.